A.P SCERT released R.C No 11 on 1st March, 2018. 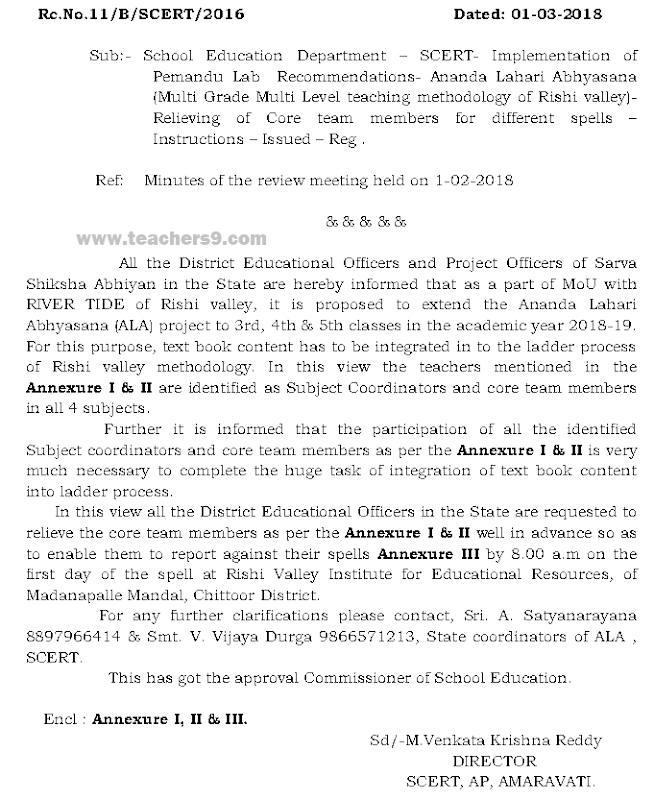 As per This R.C No 11, All the District Educational Officers and Project Officers of Sarva Shiksha Abhiyan in the State are hereby informed that as a part of MoU with RIVER TIDE of Rishi valley, it is proposed to extend the Ananda Lahari Abhyasana (ALA) project to 3rd, 4th & 5th classes in the academic year 2018-19. For this purpose, text book content has to be integrated in to the ladder process of Rishi valley methodology. In this view the teachers mentioned in the Annexure I & II are identified as Subject Coordinators and core team members in all 4 subjects.